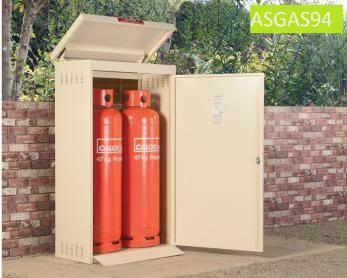 These items are produced in conjunction with Calor Gas - a leader in the supply of gas products to ensure that the cages are suitable for all your storage needs. 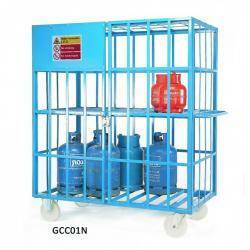 Our Propane Bottle Storage unit is designed to store 2 x 47kg gas bottles and are made from galvanized steel suitable for everyday use. Designed and manufactured in the UK with a 10 Year Warranty. An open back and vented sides - allows air circulation and gas diversion with a pre drilled top rail for a regulator to be fitted - (regulator not included). A lift up lid - allows inspection of the regulator without unlocking the unit in an emergency. 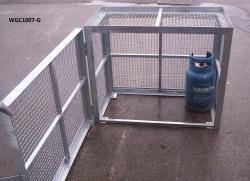 A large access door - easy to load and unload cylinders. Doors are Fitted with a utilities company style lock - allowing your gas suppler to gain entry. Security rail at the rear - chain your bottles to the back rails for extra security*** *** (chain not included). Integral base - for strength and security. A choice of colours available - to suit any environment - great for holiday homes and caravans. Virtually maintenance free - no repainting or rotting with a 10 Year Warranty. Please note: Before any installation can take place a level, firm surface will be required. (e.g. concrete, tarmac, patio 50mm/2" thick) before installation. The base must be solid, completely flat and secure. Prices include VAT and Delivery. Surcharges May Apply.